Welcome to the first edition of My Kitchen View. My hope is to include recipes, garden reports and produce pictures, food or restaurant reviews, and more. It's literally my view from the kitchen and figuratively my perspective on the happenings in and around the kitchen. The kitchen is truly the heart of our home. We spend a lot of time there preparing food, eating, and sharing around the table. It is where the delicious smells emanate from and my creative juices flow. When the weather is warm, we eagerly move out to the deck and enjoy the outdoor table and grill overlooking the backyard and neighborhood pond. I'm a little late on starting to plan our garden but time has gotten away from me! I'm looking forward to my annual plant purchasing trip - something about wandering through the rows of plants, gazing at the packets of seeds, and just smelling the dirt is incredibly motivational. This year, I'm planning 3-4 varieties of tomatoes, lettuce, peppers, onions, green beans, cucumbers, zuchini, and yellow squash as well as a several different herbs. I'm sure there will be a few more things added to that list. My favorite part is the herbs! I love cooking with fresh herbs and most of them are fairly easy to grow. I get so excited to plant them. I'm not sure what all I will grow but it will definitely include cilantro, rosemary, basil, mint, parsley, and oregano. My chives and thyme have come back every year. I may also add sage and dill to that list. I can't wait to add the fragrant plants to my backyard garden! A couple of weeks ago, I shared a recipe for Key Lime Coconut Cupcakes which I loved but I couldn't help but continue developing that recipe in my head. 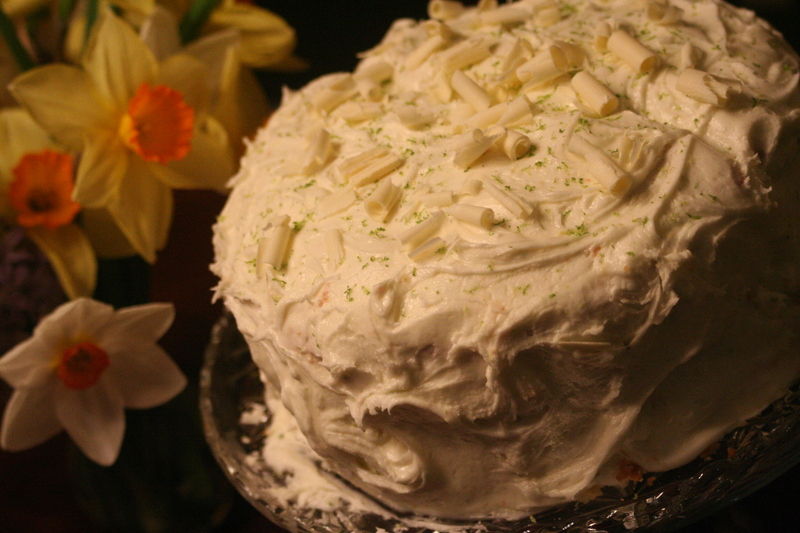 And so for Easter, I made a 4 layer Key Lime White Chocolate Cake. 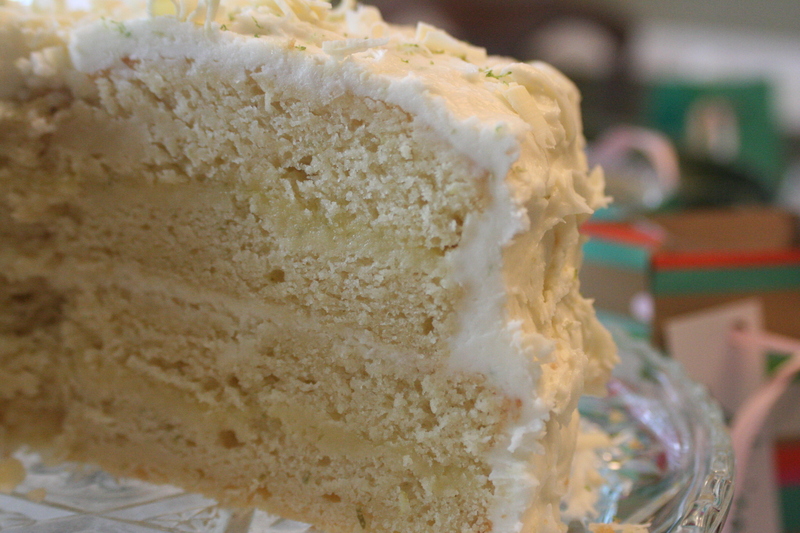 I filled two of the layers with homemade lime curd and I filled the middle layer with white chocolate lime frosting. I iced it in a lime buttercream and garnished it with lime zest and white chocolate curls. It was a bit of work but it was completely worth it! Everyone enjoyed it and I discovered how much I like making cakes from scratch! Preheat oven to 325 degrees. Grease 2 - 8 inch cake pans and if desired, line bottom with parchment paper. Using an mixer, cream the butter and sugar on high speed until light and fluffy, about 3 minutes. With the mixer on low speed, add the eggs, 1 at a time, scraping down the bowl after each addition. Add the vanilla extract, key lime zest and juice and mix well. In a separate bowl, combine the flour, baking powder, baking soda, and salt. In 5 parts total, alternately add the dry ingredients and the buttermilk to the batter, beginning and ending with the dry. Mix until just combined. Fold in the white chocolate. Divide batter between two greased 8-inch cake pans. Bake for 35-40 minutes or until the tops begin to brown and a toothpick comes out clean. Remove cakes from oven and allow to cool in the pan for 10 minutes and then turn out on a baking rack to cool completely. Makes 2 - 8 inch layers. In a small bowl, melt the white chocolate in the microwave. Let cool until just slightly warm. Meanwhile, using a hand mixer, beat the butter until light and fluffy. With the mixer on low, gradually add the powdered sugar until well combined. Add the salt, vanilla extract, key lime juice, and sour cream and mix until very smooth. Add the melted white chocolate and mix just until incorporated. Completely zest all three limes - avoiding the white pithy areas. Stir into sugar. Cream the butter and beat in the sugar and lime mixture. Add the eggs, 1 at a time, and then add the lime juice and salt. Mix until combined. Pour the mixture into a 2 quart saucepan and cook over low heat until thickened (about 10 minutes), stirring constantly. The lime curd will thicken just below simmer. Remove from the heat and cool or refrigerate. Place plastic wrap directly on the surface of the curd before refrigerating. Beat butter until light and fluffy. Add powdered sugar alternately with key lime juice until light and creamy. Add lime zest and beat until combined. - Cut the two layers in half crosswise so you have 4 equal layers. - Place the bottom layer on a plate and spread with lime curd. - Top with the next cake and spread with white chocolate lime frosting. - Top with the final layer and spread with lime curd. 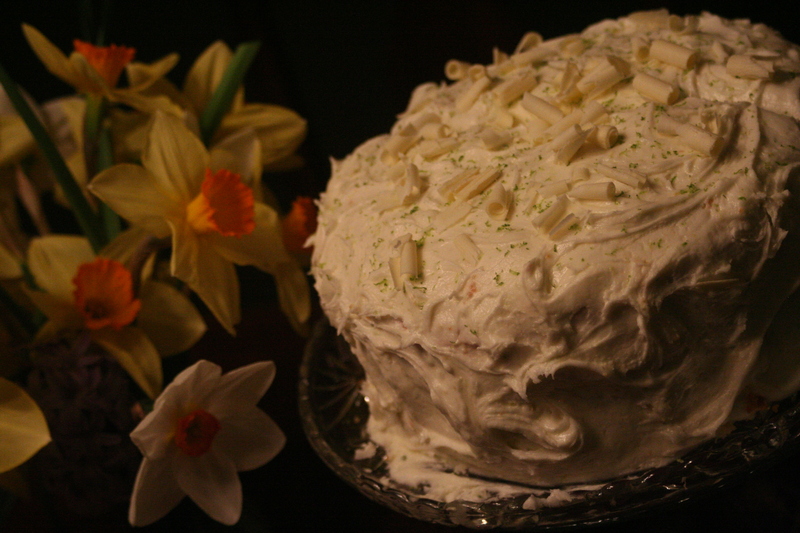 - Frost the cake with lime buttercream icing. - Swirl the frosting and top with white chocolate curls and fresh key lime zest. When's the best time to begin planting your garden? (not sure if I am wording this correctly). It depends on what you want to plant, whether you are starting with seeds or plants, and what zone you live in. Some of the early plants/seeds like peas should already be in the ground here in Indiana. When you are starting with plants, you want to wait until there is little risk of frost. I recommend checking out a gardening book that includes information specific to your area as well as checking the seed packets and plants you intend to put in your garden. It's definitely not too late to plant a garden this year! And there are some things you can plant late summer for fall produce! I want to eat this cake, WOW. I linked to this post today because I cannot stop thinking about that cake! It looks so yummy. I was excited to find this recipe! I made this yesterday, and warn you that the amount of butter is WRONG---use 1 1/2 sticks, not cups! Sandra, I'm so glad you enjoyed it. This is my original recipe and has been made by myself and others. The amount of butter is correct - it is a 4 layer cake and calls for 3 sticks of butter. Indulgent - yes! :) Delicious - for sure!